No, I think it’s just a touch of food poisoning! Famous last words, almost. Don’t read further if you don’t like medical stories. I haven’t been blogging for a few weeks – busy at a conference in Saskatchewan and then sitting at son’s hospital bedside. Son (age 28) demonstrated the hazards of not believing that the excruciating stomach pain really could be life-threatening. After a ruptured appendix, peritonitis, systemic blood infection and pneumonia, involving 13 days in the hospital, he is now at his home recuperating. I find it very hard to create a clever and entertaining blog about the experience, from a mother’s point of view! 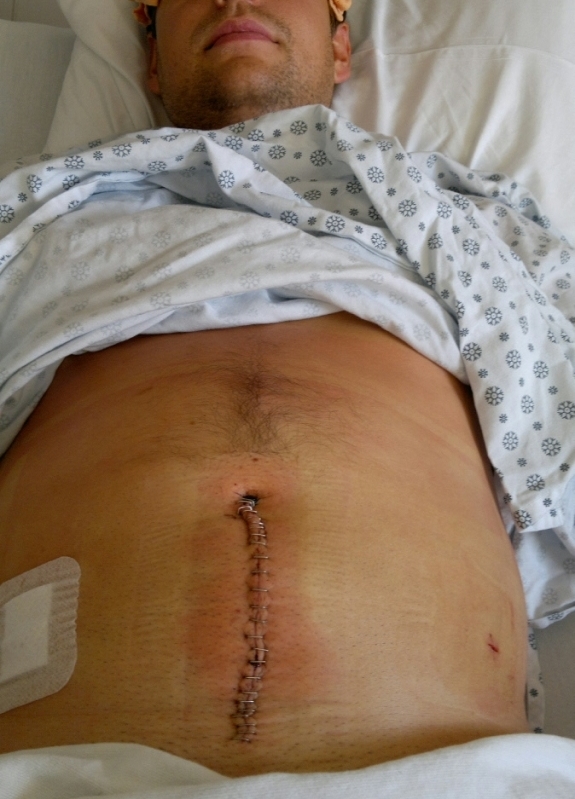 Here is a photo showing rather drastic surgery on my son’s abdomen. As I told him, sometimes it is an advantage to have a hairy belly. Am I allowed to blog about my mother’s heart attack? What a wild experience. I hope he is recovering well. I had my appendix out – there was absolutely no doubt about what was going on as I had classic symptoms. I went home the same day, and was back in nursing school the following week – just couldn’t lift anything. I had an incision somewhere between the 2 examples you posted, probably about 5 inches long. I understand a lot of appendectomies are performed using just the small incisions, but mine was not. I am so glad that you have health care – my younger son is experiencing stomach issues but cannot afford to get treatment. I worry about him so much. Yes, he is recovering, but has been told to take it easy for a few months. It is crazy that the issue of health care is so politically polarized in the US and that there is so much misguided fear of it! Let’s hope that changes soon. So sorry – but glad he is doing better. Hi Diane. Thanks for commenting. I know what you’ve been through, and the enormous relief that comes when it’s over. I’m glad to hear that the worst is over. It’s just a reminder that no matter how grown up our children are, we never stop feeling like–and being–a Mom. I felt a little guilty (but happy) that his girlfriend took the load of being the #1 support person, especially since I was away at the start. Yes, once it is over, the sun shines brighter. Wow….does he know you’ve posted pix of his belly. This confirms the fact that men seek medical attention as a very last resort. Hi Clare, I clicked on this post after you “liked” one of mine. Glad to know that your son is now well and has an excuse for not helping … seriously though, that sounds like a rather messy ordeal that he went through. And now, he has a tummy that looks not unlike mine — stem to sternum scar. They heal. It’s knowing that you’re not immortal that’s the tough thing to swallow! Wishing him (and you and the rest of his support system) well. You are right that realizing his mortality was the important lesson. Thanks for the note. I’m pleased to tell you that I have just nominated you for the Very Inspiring Blogger Award. You may choose to accept or not. If you do accept the award there are some rules . . .
▪	Place the award on your site. ▪	Share 7 random things about yourself. ▪	Nominate 15 blogs. Let them know they’ve been nominated and how to accept the award.